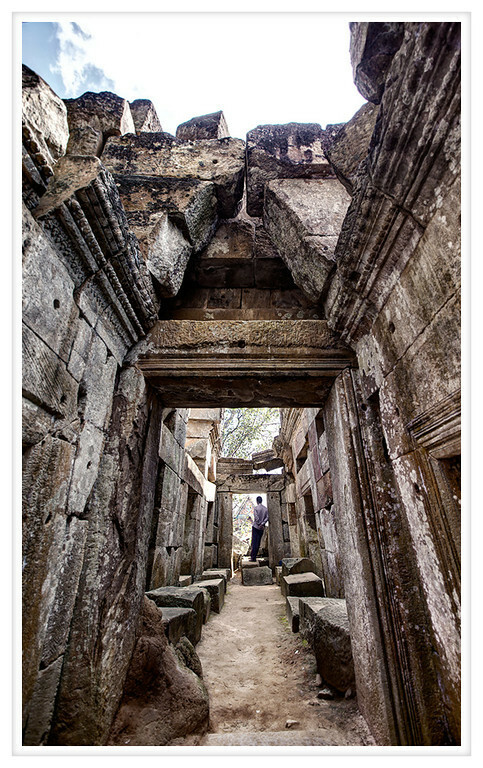 These are some of the ruins at Wat Ek Phnom just outside of Battambang. It is an interesting temple complex is part because there is a new temple that is built directly in front of the old crumbling one. Built in the 11th century Wat Ek Phnom is not a very popular temple with tourists but it is frequently used by locals who come and picnic along the ancient baray, a large man-made body of water, filled with lilies. When we visited there were a few other foreigners exploring the site but it was mostly unused. The altar in the ruins is partially intact and the stubs of incense indicate that many people still climb the tumbled stones to pray. It is a place suitable for quiet contemplation as it is off the beaten track so there is little to intrude on your meditations. Wat Ek Phnom was the first of many temple ruins we visited and although it was not the most impressive it is a much more peaceful site than many we explored.